Looking for some fun on a rainy day? Pull out the Nina Ottosson Dog Casino! 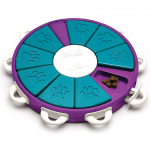 The idea of the game is to get your dog to look for treats by pulling out the flaps in different directions. In each flap there is a compartment where a treat can be hidden. 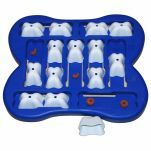 You can increase the degree of difficulty by locking the flaps using the bone-shaped pegs on top. The first few times you use it, you can make it a little easier for your dog by not pushing the flaps all the way in, so that the dog can smell and see a little of the treat. Try to get the dog to push the flap with its nose or paw in order to pull it out. Once your dog has begun to understand how the flaps work, you can make it more difficult by pushing the flaps all the way in before the dog begins looking for the treats. The next step is to lock some of the flaps using the pegs on the top. Your dog then has to learn how to lift up the pegs in order to pull out the flaps. A tip is to place a treat under a peg. Once your dog has understood how the pegs works all the flaps can be locked. Of all the Nina Ottosson toys this is probably the most complex. It must be introduced to your dog at the simplest level first, ie all the pegs taken out of the top and just treats in the drawers. Most dogs seem to find the drawers by accident when pawing at the toy trying to find the treat. You can help your dog by showing them how to open the drawers to get at the treat. Once they discover how it works they can then open the drawers with some work. The second level of difficulty is discovering that the drawers do not open unless the pegs are removed first. We haven't tried this yet. Still working on opening the drawers! Really happy with this :) I purchased this for my sisters dog for an xmas presents because her and her husband are working long hours so wanted to get something to entertain the dog during the day. After buying countless toys only to see them destroyed within 3.29 minutes, we sought a toy which would be fun, durable and a bit challenging for our two dachshund's, Rommel and Lieblings. We've found the Dog Casino Toy to be an excellent solution to these requirements. Before the casino arrived, we expected ball-obsessed Rommel to have minimal interest and the more food-oriented Lieblings to pay more interest. Both were immediately interested in the toy but we were really surprised to see that it was Rommel who, I guess enjoying the human interaction, was the one who quickly learned how to remove the bones to get the treats. The hunds are still working out how to remove the bones to unlock the drawers (their method at present is to topple the casino and attempt to break its neck) so I think there is still a great deal of life left in this toy. 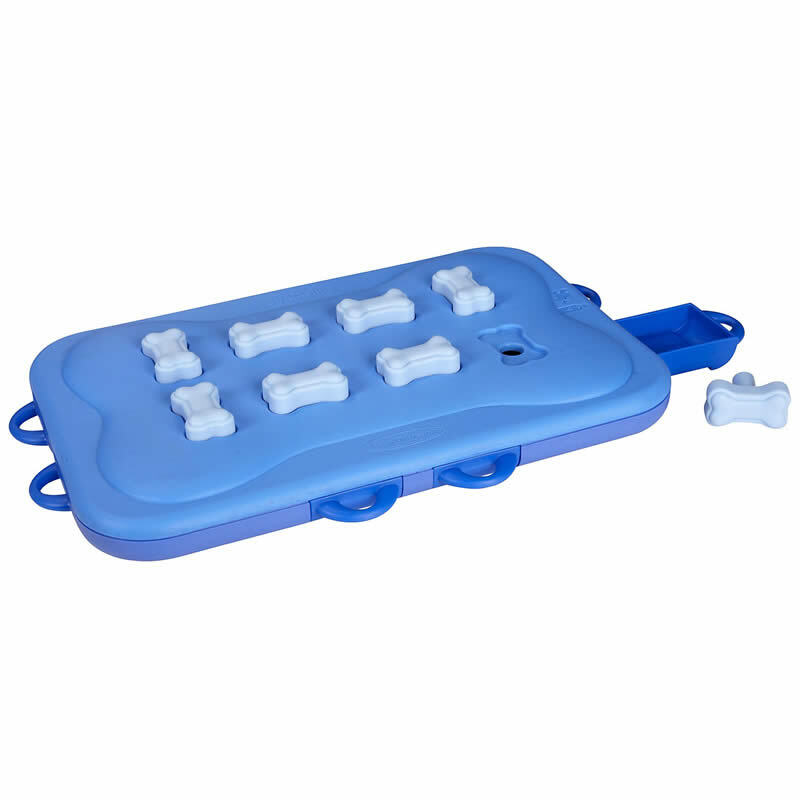 Read 6 customer reviews of Nina Ottosson Dog Casino Toy. The average customer rating is 4.8. My dog is a star!!! She mastered this puzzle even before I had!!! Go to the top of the class Minx. We've found this toy great so far. Eshe, our 13 month old Rhodesian Ridgeback, has worked out how to very quickly pull the drawers out now, but is still working on the technique for pulling out the bone locks. She is managing to spin them around and get her tongue underneath to scoop out the treat... but not always pulling them fully out to unlock the drawer! We can certainly see her thinking and stretching her brain to remember what to do. She is a 40kg puppy that has a good crack at this toy and apart from a few small scratches it seems very tough and like it will last a long time. We are happy with our purchase and will be looking to get her another of these types of products. Great fun though and all the dogs love it.! St Helens Dog Obedience. It only took us a few hrs of practise on Christmas Day and Chuckie (the dog) got the hang of it. Awesome toy. Took my pup a good ten minutes to work it out but now you can't stop him. Really good quality and very tough.